The Beauty Scoop! : My £60 Party Preparation Package Challenge! Christmas parties and nights out can often end up costing a fortune in pre-party preparations alone, with salon appointments for beauty treatments and other general pampering often taking up a large chunk of your budget. In fact, the Most Wanted team at VoucherCodes did some research and found out that 18-24 year olds are spending an average of £110 on their party season beauty bits! So, they approached me and set me the challenge of reducing that outlay to just £60!! Yes girls, you did just read that right, 60 English pounds for a party package to last throughout all the festivities! And so this week, I’ve been getting creative and finding my favourite, fabulous products for you to reach for, instead of spending all your drinking money on salon treatments that could be avoided, leaving you enough money to buy some perfect presents for your nearest and dearest. Tanning is an important one for a lot of people, and professional spray tans can be costly, but with a fab selection of ‘at home’ products widely available, there is money to be saved here. Fake Bake ‘Perfection’ Instant Fake Tan & Mitt (£10.98) has been one of my staple products over the last year or so, it’s incredibly easy to use because the colour is instant, no development time is needed – just apply, and then get dressed (especially good for people like me, who never leave enough time to apply and then let a tan develop before they go out), and the colour is great, not in the least bit orange… plus it smells beautiful; vanilla, girls, no biscuits!! I generally just apply to the areas that will be ‘on show’ because there’s not much point in doing a full body application (unless your full body will be on show, of course) and also it lasts longer, giving you more applications this way too. Pre-tan preparation is important if you want a nice, even colour - even when using an instant/wash off formula. Now, I could tell you to go and buy an expensive exfoliator from one of the tanning brands, but you really don't need to do that. You can achieve the same result, using a normal body wash with a pair of scrubby, exfoliating gloves for a fraction of the price. The pair in the image above from Boots, (£2.69) do the trick nicely, although if you go to local pound shops/discount stores, I reckon you'd get a pair for £1 or less. Hair appointments are also quite costly to factor into your beauty budget when getting ready for a night out. I’m talking styling and conditioning treatments, rather than your regular cut/colour appointments (but if you want to find a way of cutting down those costs – pun intended, this post may be useful for you), so I’m not factoring that into the budget, since I expect those would come from your regular maintenance funds. When your hair is in good condition, it is generally easier to style, so a conditioning treatment/mask is my first recommendation. I love Wella's System Professional hair masks (£12.71), they’re used by hairdressers and professionals in the salon I go to and in my book, if they’re good enough for them, then they’re good enough for me. Obviously you’ll be choosing the perfect mask for your hair condition and texture, but I love the Volumize on my hair, as it conditions without weighing it down! To get the true salon feel of a head massage, I really recommend using the Denman BeBop Massage Brush (£2.87) (also available from boots for about £3.80) to massage the conditioning treatment into your hair, and also to use when shampooing to make sure your scalp is squeaky clean - just don't massage too vigorously at this stage if your hair is longer than your chin, as it could make your hair a bit knotty. For almost effortless styling, rollers are your friend as once in, they do the work for you! I'd love to to suggest some heated rollers here as there are some fabulous sets available these days, but this would completely bust the budget, so instead I’ll recommend 'Velcro Sleep-In Rollers' (£17.95) as my favourite non-heated variety instead as they're a cheaper option but without too much of a compromise in results! I’m not including this in the budget as many of you will probably already have styling products, but I really rate Aussie’s 'Aussome Volume Conditioning Mousse' when I want a bit of oomph in my hair as it gives volume without being sticky and horrible – just remember to blow dry your hair when using it, it doesn’t work quite so well if you leave it to air dry. If you did fancy trying it, it’s available from Boots for £4.89. This, along with a spritz of hairspray (which I’m also assuming you’ll already have, but I swear by Elnett Very Volume available from boots for £6.49 for 400ml) will keep your hair looking great throughout the evening. Finishing Touches & Handy Tips! A manicure might be the next thing on your list, and whilst it's lovely to have your nails done for you, it's not impossible to do them yourself for less of a financial outlay - especially if you get a friend to do yours, in return for you doing theirs (which certainly makes your weaker hand application better - you know this dilemma, don't you?!). 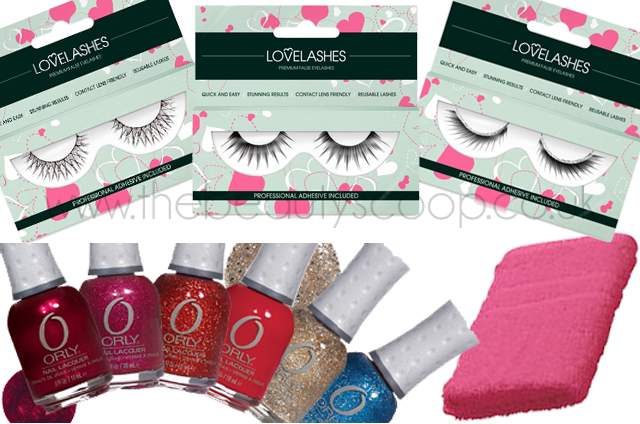 I love nail polish, from a whole host of brands, but I'm recommending ORLY Nail Lacquer (£7.50), as I've never had a bad polish from them and they also have some beautiful colours out right now that are perfect for party season - the polishes shown in the image above is their 'Naughty or Nice' collection. They're also currently on offer at Beauty Bay for £7.13 each. If you're a fan of false lashes, you could pay around £15 having them applied at a salon... or you could spend just £3.20 (by using code SCOOP-20) plus £1 delivery for orders under £15 on a fab set of lashes from LoveLashes at Lashizzle (more styles being added on a regular basis)! This discount code is exclusively for readers of The Beauty Scoop, and will be valid at least until the end of December 2012. Fancy a facial? Give yourself an exfoliating facial on the cheap by using your everyday skincare products and putting in a bit more effort. Massage your cleanser into dry/damp skin (depending on the texture of the products you're using), and then use a hot flannel to exfoliate the cleanser off, before massaging your serums and moisturisers in afterwards (if you have a face mask already, you could also use this in-between washing and moisturising). It's simple, but effective, and what's even better is that you can get yourself a flannel for less than £1, with the flannel in the image above, from Tesco costing just 75p(! ), although you can get them from about 20p each from cheap shops like home bargains etc. So there you have it, my budget saving products all in one handy post; and in total, these products come to a very reasonable £58.28 (excluding any postage costs), leaving you just under £2 to splurge on whatever you like, maybe a £1 product from the MUA range at Superdrug? What do you think? Do you think you'd swap your salon treatments to save money? Maybe you have a few budget beauty tips of your own?! Wow!!! Great job! You have really done it well. I wish I can do that too.